2019 Lifetime Achievement Award Winner Ella Annabelle Effat Kazerooni, M.D., M.S. 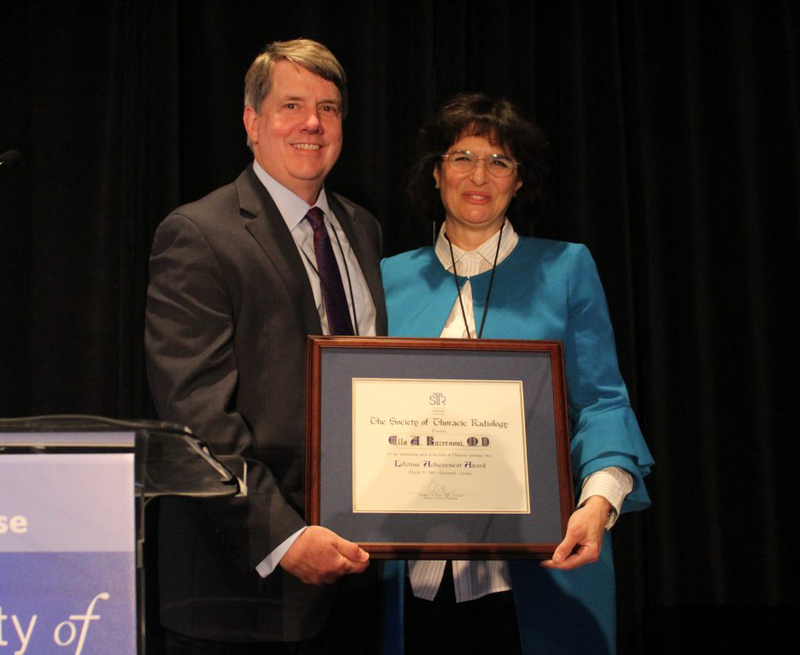 The Society of Thoracic Radiology (STR) has awarded the 2019 Lifetime Achievement Award to Ella Annabelle Effat Kazerooni, M.D., M.S. Ella is a Professor in the Department of Radiology, Cardiothoracic Radiology Division at the University of Michigan Medical School, Ann Arbor, Michigan. She holds a joint appointment as a Professor in the Department of Internal Medicine, Pulmonary & Critical Care Medicine Division. Ella is a true Michigan “blue” having been awarded an B.S. in Biomedical Sciences with Distinction and M.D. in the Integrated Premedical – Medical Program “Inteflex” Program of the University of Michigan School of Literature Science & the Arts and Medical School. She also holds a M.S. in Clinical Research Design & Statistical Analysis from the School of Public Health of the University of Michigan in Ann Arbor, Michigan. She also completed here Residency in Diagnostic Radiology at the University of Michigan and had a small detour for Fellowship in Thoracic Imaging at Massachusetts General Hospital, Harvard Medical School, in Boston, Massachusetts.